This article is about passing on of property or other rights or obligations after a person's death. For inheritance of genes, see heredity. For other uses, see Inheritance (disambiguation). "Heir" redirects here. For other uses, see Heir (disambiguation). 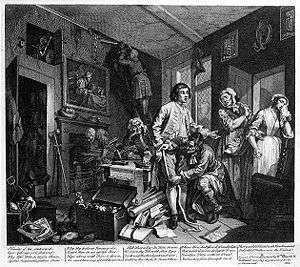 From William Hogarth's A Rake's Progress. "The Young Heir Takes Possession Of The Miser's Effects". Inheritance is the practice of passing on property, titles, debts, rights, and obligations upon the death of an individual. The rules of inheritance differ between societies and have changed over time. In law, an heir is a person who is entitled to receive a share of the deceased's (the person who died) property, subject to the rules of inheritance in the jurisdiction where the deceased (decedent) died or owned property at the time of death. A person does not become an heir before the death of the deceased, since the exact identity of the persons entitled to inherit is determined only then. Members of ruling noble or royal houses expected to become heirs are called heirs apparent if first in line and incapable of being displaced from inheriting by another claim; otherwise, they are heirs presumptive. There is a further concept of joint inheritance, pending renunciation by all but one, which is called coparceny. In modern law, the terms inheritance and heir refer exclusively to succession to property by descent from a deceased dying intestate. Takers in property succeeded to under a will are termed generally beneficiaries, and specifically devisees for real property, bequestees for personal property, or legatees for money. For more details on this topic, see Historical inheritance systems. Detailed anthropological and sociological studies have been made about customs of patrilineal inheritance, where only male children can inherit. Some cultures also employ matrilineal succession, where property can only pass along the female line, most commonly going to the sister's sons of the decedent; but also, in some societies, from the mother to her daughters. Some ancient societies and most modern states employ egalitarian inheritance, without discrimination based on gender and/or birth order. The Quran introduced a number of different rights and restrictions on matters of inheritance, including general improvements to the treatment of women and family life compared to the pre-Islamic societies that existed in the Arabian Peninsula at the time. The Quran also presented efforts to fix the laws of inheritance, and thus forming a complete legal system. This development was in contrast to pre-Islamic societies where rules of inheritance varied considerably. Furthermore, the Quran introduced additional heirs that were not entitled inheritance in pre-Islamic times, mentioning nine relatives specifically of which six were female and three were male. In addition to the above changes, the Quran imposed restrictions on testamentary powers of a Muslim in disposing his or her property. In their will, a Muslim can only give out a maximum of one third of their property. The Quran contains only three verses that give specific details of inheritance and shares, in addition to few other verses dealing with testamentary. [Quran 4:11,12,176] But this information was used as a starting point by Muslim jurists who expounded the laws of inheritance even further using Hadith, as well as methods of juristic reasoning like Qiyas. Nowadays, inheritance is considered an integral part of Sharia law and its application for Muslims is mandatory, though many peoples (see Historical inheritance systems), despite being Muslim, have other inheritance customs. The inheritance is patrilineal. The father —that is, the owner of the land— bequeaths only to his male descendants, so the Promised Land passes from one Jewish father to his sons. If there were no living sons and no descendants of any previously living sons, daughters could inherit. In Numbers 27:1-4, the daughters of Zelophehad (Mahlah, Noa, Hoglah, Milcah, and Tirzah) of the tribe of Manasseh come to Moses and ask for their father's inheritance, as they have no brothers. The order of inheritance is set out in Numbers 27:7-11: a man's sons inherit first, daughters if no sons, brothers if he has no children, and so on. The tractate Baba Bathra, written during late Antiquity in Babylon, deals extensively with issues of property ownership and inheritance according to Jewish Law. Other works of Rabbinical Law, such as the Hilkhot naḥalot : mi-sefer Mishneh Torah leha-Rambam, and the Sefer ha-yerushot: ʻim yeter ha-mikhtavim be-divre ha-halakhah be-ʻAravit uve-ʻIvrit uve-Aramit also deal with inheritance issues. The first, often abbreviated to Mishneh Torah, was written by Maimonides and was very important in Jewish tradition. All these sources agree that the firstborn son is entitled to a double portion of his father's estate: Deuteronomy 21:17. This means that, for example, if a father left five sons, the firstborn receives a third of the estate and each of the other four receives a sixth. If he left nine sons, the firstborn receives a fifth and each of the other eight receive a tenth. If the eldest surviving son is not the firstborn son, he is not entitled to the double portion. Philo of Alexandria and Josephus also comment on the Jewish laws of inheritance, praising them above other law codes of their time. They also agreed that the firstborn son must receive a double portion of his father's estate. The distribution of the inherited wealth is often unequal. The majority might receive little while only a small number inherit a larger amount, with the lesser amount given to daughter in the family. The amount of inheritance is often far less than the value of a business initially given to the son, especially when a son takes over a thriving multimillion-dollar business, yet the daughter is given the balance of the actual inheritance amounting to far less than the value of business that was initially given to the son. This is especially seen in old world cultures, but continues in many families to this day. Arguments for eliminating the disparagement of inheritance inequality include the right to property and the merit of individual allocation of capital over government wealth confiscation and redistribution, but this does not resolve the problem of unequal inheritance. In terms of inheritance inequality, some economists and sociologists focus on the inter generational transmission of income or wealth which is said to have a direct impact on one's mobility (or immobility) and class position in society. Nations differ on the political structure and policy options that govern the transfer of wealth. According to the American federal government statistics compiled by Mark Zandi in 1985, the average US inheritance was $39,000. In subsequent years, the overall amount of total annual inheritance was more than doubled, reaching nearly $200 billion. By 2050, there will be an estimated $25 trillion average inheritance transmitted across generations. Some researchers have attributed this rise to the baby boomer generation. Historically, the baby boomers were the largest influx of children conceived after WW2. For this reason, Thomas Shapiro suggests that this generation "is in the midst of benefiting from the greatest inheritance of wealth in history." Inherited wealth may help explain why many Americans who have become rich may have had a "substantial head start". In September 2012, according to the Institute for Policy Studies, "over 60 percent" of the Forbes richest 400 Americans "grew up in substantial privilege". The French economist Thomas Piketty studied this phenomenon in his best-selling book Capital in the Twenty-First Century, published in 2013. Inheritance has a significant effect on stratification. Inheritance is an integral component of family, economic, and legal institutions, and a basic mechanism of class stratification. It also affects the distribution of wealth at the societal level. The total cumulative effect of inheritance on stratification outcomes takes three forms. The first form of inheritance is the inheritance of cultural capital (i.e. linguistic styles, higher status social circles, and aesthetic preferences). The second form of inheritance is through familial interventions in the form of inter vivos transfers (i.e. gifts between the living), especially at crucial junctures in the life courses. Examples include during a child's milestone stages, such as going to college, getting married, getting a job, and purchasing a home. The third form of inheritance is the transfers of bulk estates at the time of death of the testators, thus resulting in significant economic advantage accruing to children during their adult years. The origin of the stability of inequalities is material (personal possessions one is able to obtain) and is also cultural, rooted either in varying child-rearing practices that are geared to socialization according to social class and economic position. Child-rearing practices among those who inherit wealth may center around favoring some groups at the expense of others at the bottom of the social hierarchy. The degree to which economic status and inheritance is transmitted across generations determines one's life chances in society. Although many have linked one's social origins and educational attainment to life chances and opportunities, education cannot serve as the most influential predictor of economic mobility. In fact, children of well-off parents generally receive better schooling and benefit from material, cultural, and genetic inheritances. Likewise, schooling attainment is often persistent across generations and families with higher amounts of inheritance are able to acquire and transmit higher amounts of human capital. Lower amounts of human capital and inheritance can perpetuate inequality in the housing market and higher education. Research reveals that inheritance plays an important role in the accumulation of housing wealth. Those who receive an inheritance are more likely to own a home than those who do not regardless of the size of the inheritance. Often, minorities and individuals from socially disadvantaged backgrounds receive less inheritance and wealth. As a result, mixed races might be excluded in inheritance privilege and are more likely to rent homes or live in poorer neighborhoods, as well as achieve lower educational attainment compared with whites in America. Individuals with a substantial amount of wealth and inheritance often intermarry with others of the same social class to protect their wealth and ensure the continuous transmission of inheritance across generations; thus perpetuating a cycle of privilege. Nations with the highest income and wealth inequalities often have the highest rates of homicide and disease (such as obesity, diabetes, and hypertension). A New York Times article reveals that the U.S. is the world's wealthiest nation, but "ranks twenty-ninth in life expectancy, right behind Jordan and Bosnia." This has been regarded as highly attributed to the significant gap of inheritance inequality in the country, although there are clearly other factors such as the healthcare system. When social and economic inequalities centered on inheritance are perpetuated by major social institutions such as family, education, religion, etc., these differing life opportunities are transmitted from each generation. As a result, this inequality becomes part of the overall social structure. Many states have inheritance taxes or death duties, under which a portion of any estate goes to the government. ↑ Dubner, Stephen. "How Big of a Deal Is Income Inequality? A Guest Post". The New York Times. August 27, 2008. "Inheritance". Encyclopædia Britannica. 14 (11th ed.). 1911.